Bangus deboning is the process of removing the intermuscular and nuisance bones of bangus by manual method through the use of a forceps. The finished product is boneless bangus. Boneless bangus is becoming a popular food item in the Philippines because of the convenience derived when eating as brought forth be the absence of the numerous bones. The boneless fish may be cooked (fried), dried, smoked or frozen with or without adding any spices. 1) Wash fish. The scales may or may not be removed. Split fish into butterfly style. Remove the internal organs, gills, blood and slime. Wash thoroughly. 2) Remove the backbone and dorsal fin by means of a sharp knife. 3) With the use of forceps, start removing the rid bones. This can easily be removed because they are superficially embedded. 4) Make a superficial slit along the vent of the dorsal and ventral muscles with the edge of the knife. Remove the spines one after the other by inserting the pair of forceps/twissor between the segments of the dorsal and ventral muscles. 5) Continue removing the spines in a similar manner on the dorsal and ventral area. From the dorsal portion, there are approximately 44 branching spines embedded between the muscle segments. 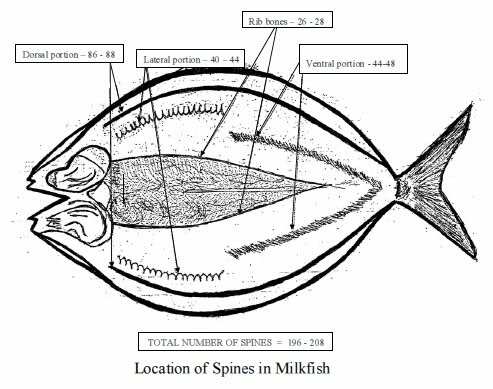 Starting from the nape along the lateral line are also embedded 22 spines and along the ventral muscles are approximately 24 spines. Do you like this business ideas for entrepreneurs? content“>then please consider subscribing to our PINOY BISNES RSS feed. You can also subscribe by email and have new articles sent directly to your inbox. (Once you entered your e-mail address, you need to login to your e-mail account and click the link to confirm your subscription). yes it is true events on how to debone the milkfish.